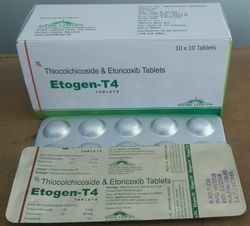 Offering you a complete choice of products which include acelofenac 100 mg with thiocholchicoside 8 mg, aceclofenac with paracetamol suspension, etodolac 600 mg sustained release, etodolac-600 extended release, etoricoxib 60 mg tablets and etoricoxib 120 mg tablet. This medication belongs to a Non Steroidal Anti-inflammatory Drugs (NSAIDs). NSAIDs help reduce pain, inflammation, and fever. It acts anti-inflammatory by lowering levels of COX-2 prostaglandin, a hormone-like substance that usually causes inflammation. If patient experiences any of these side effects, they should report it to doctor right away. Disclaimer: This information is not a substitute for medical advice. Always speak with your doctor or pharmacist about dosages that are right for you. This information is only a guide line for marketing professionals and is insufficient for Medical Practioners to prescribe. o The dose is 600 mg (SR) per day. Disclaimer: Our goal is to provide you with the most relevant and current information. However, because drugs affect each person differently, we cannot guarantee that this list includes all possible dosages. This information is not a substitute for medical advice. Always speak with your doctor or pharmacist about dosages that are right for you. This information is only a guide line for marketing professionals and is insufficient for Medical Practioners to prescribe. 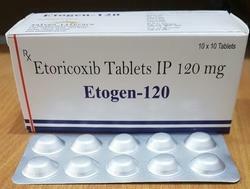 Anti-inflammatory painkillers like etoricoxib are also called non-steroidal anti-inflammatory drugs (NSAIDs), or sometimes just 'anti-inflammatories'. 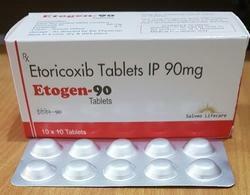 Etoricoxib eases pain and swelling (inflammation) in conditions like osteoarthritis, rheumatoid arthritis and ankylosing spondylitis, and it may also be used for short periods of time in gout. in 60mg and 90mg strengths. 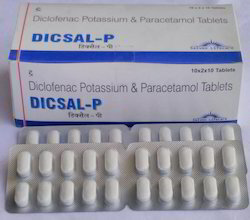 Dicsal-P Tablet Composition: Diclofenac potassium BP 50 mg Paracetamol IP 325 mg Diclofenac Potassium is a nonsteroidal anti-inflammatory drug (NSAIDs) that exhibits anti- inflammatory, analgesic, and antipyretic activities. Paracetamol, also known as Acetaminophen, is commonly used for its analgesic and antipyretic effects. Indications and Usage: Diclofenac Potassium: ??? For treatment of primary dysmenorrhea. ??? For relief of mild to moderate pain. ??? For relief of the signs and symptoms of osteoarthritis. ??? For relief of the signs and symptoms of rheumatoid arthritis. Paracetamol: ??? For mild to moderate pain (from headaches, menstrual periods, toothaches, backaches, osteoarthritis, or cold/flu aches and pains). ??? To reduce fever. Rationale of Combination: Product Description: Diclofenac potassium is used as an anti-inflammatory agent to pacify mild to moderate pain and inflammation. Common conditions associated with pain and inflammation includes arthritis, trauma, surgery and fibermyalgia whereas paracetamol is used for temporary relief of fever, minor aches, and pains. Pharmacology: Diclofenac Potassium: Diclofenac is an acetic acid non-steroidal anti-inflammatory drug (NSAID) with analgesic and antipyretic properties. Diclofenac inhibits the production of prostaglandins by inhibiting COX-1 and COX-2 pathways thereby exhibiting anti- inflammatory effects. Absorption: Well absorbed following oral administration. Distribution: widely distributed in animals. Plasma protein binding exhibited is >99%. Elimination: Hepatic metabolism leads to elimination through urine. 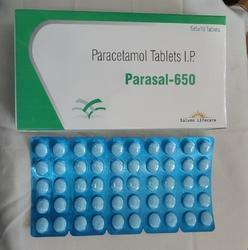 Paracetamol: Paracetamol is a widely used analgesic and antipyretic agent. Absorption: Paracetamol is well absorbed in gastro intestinal tract. Oral bioavailability is dose dependant since the half life of Paracetamol is 1-3hrs. Distribution:Paracetamol is distributed throughout the body fluids in a homogeneous way. Paracetamol given at therapeutic doses binds to plasma proteins at less than 20%. Elimination: Metabolites are excreted through the kidneys in the urine. Adverse Effects: ??? Skin rash ??? Diarrhea ??? Gastrointestinal disturbance/Abdominal pain (or stomach pain)/Heartburn or ??? Nose bleed ??? Nausea ??? Allergic reactions ??? Dizziness Contraindications: Contraindicated in patients with severe ulcer gastrointestinal bleeding, and hypersensitivity. Diclofenac sodium and Serratiopeptidase is contraindicated in patients with asthma, renal or hepatic disorders, hypertension, porphyria, peri- operative pain in CABG surgery patients and bleeding disorders. Precautions: Paracetamol causes increased risk of liver damage in chronic alcoholics along with an increased risk of toxicity with high doses or long term administration of , carbamazepine, hydantoins, isoniazid, rifampin and sulfinpyrazone. Diclofenac potassium , should be taken with food. Take the drug immediately after meals to avoid GI disturbances. •Trauma Surgery: In sports injuries, sprains, laceration, fractures, dislocation and osteoarthritis etc. and minimizing risk of graft rejection along with reduction in pain. •Dermatology: Particularly useful in acutely painful inflamed dermatoses. •Dentistry: Helps better control over dental infections and inflammation. partum hematomas, breast engorgements and pregnancy-related thrombophlebitis. 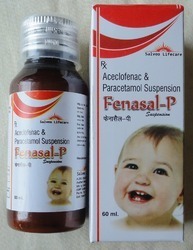 FENASAL-PT4 is contraindicated in patients with hypersensitivity to any of the ingredients, in those known to have bronchospasm or acute rhinitis or urticaria with aspirin or similar agents, presence of active or suspected peptic ulcer, gastrointestinal or other active bleeding, bleeding disorders, severe heart or kidney or liver failure. It is not advocated in children, and during pregnancy and lactation. FENASAL-PT4 should be administered with caution in patients with acid-peptic disease, inflammatory bowel disease, impaired renal or liver functions, blood dyscrasias, SLE, porphyria, hematopoietic and coagulation disorders, and in patients with hypersensitivity to aspirin or other NSAIDs. Aceclofenac (in FENASAL-PT4) is to be advocated with due caution in those on diuretics, or otherwise at risk of hypovolemia. It should be used in pregnant women and nursing mothers only if absolutely required. Data on safety and efficacy of aceclofenac (in FENASAL-PT4) in children is not adequate. In those receiving long-term FENASAL-PT4, periodical monitoring of renal and hepatic functions and blood counts is necessary. Aceclofenac (in FENASAL-PT4) should be co-administered with caution along with oral thrombolytics, diuretics, cyclosporine, tacrolimus, phenytoin, digoxin, cimetidine, tolbutamide, phenylbutazone, amiodarone, miconazole, sulfaphenazole, methotrexate, lithium, and highly protein-bound drugs. Since serratiopeptidase may increase the action of anticoagulative drugs, these must be coadministered with caution with FENASAL-PT4. Intake of alcohol with FENASAL-PT4 must be with due precaution. ADULTS: I FENASAL-PT4 Tab daily 1-2 hours after meals, or as prescribed. Diclofenac Potassium is a nonsteroidal anti-inflammatory drug (NSAIDs) that exhibits anti- inflammatory, analgesic, and antipyretic activities. Paracetamol, also known as Acetaminophen, is commonly used for its analgesic and antipyretic effects. Serratiopeptidase is a proteolytic enzyme (protease) produced by Enterobacterium Serratia sp. E-15 used in the prevention of pain and swelling. For mild to moderate pain (from headaches, menstrual periods, toothaches, backaches, osteoarthritis, or cold/flu aches and pains). Diclofenac potassium is used as an anti-inflammatory agent to pacify mild to moderate pain and inflammation. Common conditions associated with pain and inflammation includes arthritis, trauma, surgery and fibermyalgia whereas paracetamol is used for temporary relief of fever, minor aches, and pains. Additionally, serratiopeptidase helps to reduce fluid retention in affected areas, which contributes to proper drainage and a quicker recovery. Diclofenac is an acetic acid non-steroidal anti-inflammatory drug (NSAID) with analgesic and antipyretic properties. Diclofenac inhibits the production of prostaglandins by inhibiting COX-1 and COX-2 pathways thereby exhibiting anti- inflammatory effects. Distribution: widely distributed in animals. Plasma protein binding exhibited is >99%. Elimination: Hepatic metabolism leads to elimination through urine. Serratiopeptidase is an enzyme isolated from a non-pathogenic bacteria called Enterobacteria Serratia E15. Serratiopeptidase has powerful anti-inflammatory properties and is particularly useful for post-traumatic swelling, fibrocystic breast disease and bronchitis. It is able to digest dead tissue, blood clots, cysts, and arterial plaques. Absorption: On oral administration, serratiopeptidase is absorbed in GI tract. Distribution: Distributed throughout the body tissues, unchanged via systemic circulation. It reaches in higher concentration in inflamed tissues. Serratiopeptidase levels in inflammatory exudates rises gradually with decline in blood levels indicating that serratiopeptidase is quite rapidly transferred to the site of inflammation. Paracetamol is a widely used analgesic and antipyretic agent. 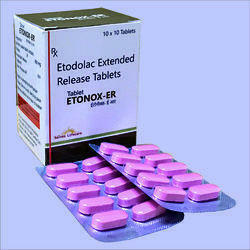 Contraindicated in patients with severe ulcer gastrointestinal bleeding, and hypersensitivity. Diclofenac sodium and Serratiopeptidase is contraindicated in patients with asthma, renal or hepatic disorders, hypertension, porphyria, peri- operative pain in CABG surgery patients and bleeding disorders. 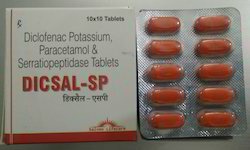 FENASAL-SP is contraindicated in patients with hypersensitivity to any of the ingredients, in those known to have bronchospasm or acute rhinitis or urticaria with aspirin or similar agents, presence of active or suspected peptic ulcer, gastrointestinal or other active bleeding, bleeding disorders, severe heart or kidney or liver failure. It is not advocated in children, and during pregnancy and lactation. 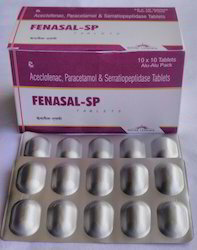 FENASAL-SP should be administered with caution in patients with acid-peptic disease, inflammatory bowel disease, impaired renal or liver functions, blood dyscrasias, SLE, porphyria, hematopoietic and coagulation disorders, and in patients with hypersensitivity to aspirin or other NSAIDs. Aceclofenac (in FENASAL-SP) is to be advocated with due caution in those on diuretics, or otherwise at risk of hypovolemia. It should be used in pregnant women and nursing mothers only if absolutely required. Data on safety and efficacy of aceclofenac (in FENASAL-SP) in children is not adequate. In those receiving long-term FENASAL-SP, periodical monitoring of renal and hepatic functions and blood counts is necessary. Aceclofenac (in FENASAL-SP) should be co-administered with caution along with oral thrombolytics, diuretics, cyclosporine, tacrolimus, phenytoin, digoxin, cimetidine, tolbutamide, phenylbutazone, amiodarone, miconazole, sulfaphenazole, methotrexate, lithium, and highly protein-bound drugs. Since serratiopeptidase may increase the action of anticoagulative drugs, these must be coadministered with caution with FENASAL-SP. Intake of alcohol with FENASAL-SP must be with due precaution. 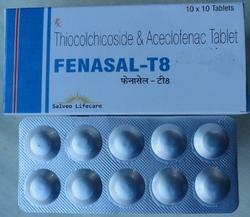 ADULTS: I FENASAL-SP Tab daily 1-2 hours after meals, or as prescribed. FENASAL-SP Tabs: Blisters of 10’s. 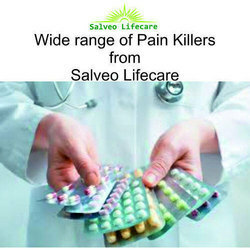 It is a pain reliever prescribed to treat a wide variety of conditions. The combination of medications makes it useful for relieving inflammation, relaxing muscle, and reducing both fevers and pains. It is commonly used to patients suffering from severe headaches, arthritis, swelling or skeletal muscle injuries. Product Description: Given the multiple pathways involved in body's perception of pain, a combination therapy is well suited for pain management. Paracetamol acts centrally and inhibits brain prostaglandin synthesis which may partly account for its well documented activity to reduce fever and to induce analgesia. Chlorzoxazone being a centrally acting muscle relaxant, relieves muscular spasms. The combination exerts a better pain control due to action on different pathways of pain. Diclofenac is a NSAID with anti­inflammatory, analgesic and antipyretic properties. It is rapidly and almost completely absorbed when administered as an oral dose. Food does not have a significant effect on the extent of oral absorption. At therapeutic concentrations it is more than 99% bound to plasma proteins. Diclofenac and/or its metabolites are rapidly and preferentially taken up and retained in inflamed tissues. It penetrates synovial fluid where concentrations may persist even when plasma concentrations fall. The terminal half­life is about 1 to 2 hours. Diclofenac acts by inhibiting cyclooxygenase, thus prevents the formation of prostaglandins, the mediators of inflammation. It also inhibits lipoxygenase thus preventing the synthesis of leukotrienes. Thus it acts on both the pathways and is a very potent anti­inflammatory drug/ medicine. Paracetamol is an effective analgesic­antipyretic (relieves mild to moderate pain) and a weak anti­inflammatory agent. 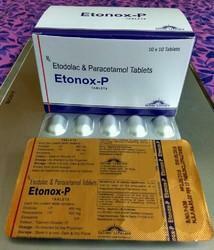 Paracetamol reduces fever by a direct action on the heat regulating centres to increase the dissipation of heat. It is readily absorbed from the g.i. tract with peak plasma concentrations occurring about 10 to 60 min. after oral administration. It is distributed into most body tissues. Chlorzoxazone is a centrally ­acting agent for painful musculoskeletal conditions. It acts primarily at the level of the spinal cord and sub cortical areas of the brain where it inhibits multi synaptic reflex arcs involved in producing and maintaining skeletal muscle spasm of varied etiology. The clinical result is a reduction of the skeletal muscle spasm with relief of pain and increased mobility of the involved muscles. Blood levels of chlorzoxazone can be detected in people during the first 30 min. and peak levels may be reached, in about 1 to 2 hours after oral administration. Drowsiness, dizziness, light­ headedness, malaise, or overstimulation may be noted by an occasional patient. Rarely, a patient may note discoloration of the urine resulting from a phenolic metabolite of chlorzoxazone. Pregnancy & Lactation ­ Not recommended in pregnant and lactating women. Contraindicated in patients with known hypersensitivity to any of the ingredients. clinical elticacy vs Ibuprofen 2400 mg (800 mg t.i.d.) for the treatment nt OA. 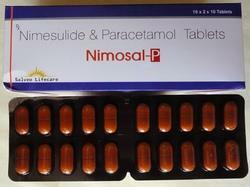 Offered by us is a comprehensive range of Nimesulide & Paracetamol Tablets to our clients. Moreover, we have some of the highly qualified professionals associated with us, who understand the varied requirements of the customers and are capable of customizing the packed quantities of these products in accordance with the clients requirements as well. We also test these products as per the international standards of quality. Nimsaid-P is available as a strip of 10 tablets and 10 such strips in a carton Information provided at this web site is of a general nature and is not intended to take the place of a physician's advice. It is vital that persons diagnosed with, or suspected of having, any disease consult with their physician to assure proper evaluation, treatment and interpretation of information contained on this site. 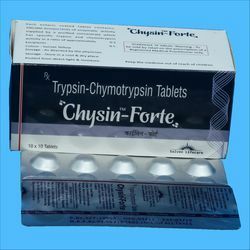 We are engaged in offering a quality-assured range of Trypsin & Chymotrypsin Tablets, fabricated using supreme quality raw material, procured from reliable sources of the industry. Our professionals test these products in tandem with international quality standards by making use of latest technology and advanced tools and equipment. Moreover, we make sure to offer these products in varied quantities in order to meet the exact requirements of the clients. rutoside trihydrate is a phytonutrient. 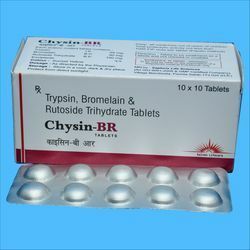 one chysin-br tablet three times a day or as directed by physician. trypsin and bromelain are proteolytic enzymes. they break peptide bond inside protein molecules. bromelain exerts anti-inflammatory activity by affecting prostaglandin synthesis. rutoside is a glycoside and has antioxidant effect. it increases the strength of the walls of the blood capillaries and regulates their permeability. Paracetamol (Acetaminophen) is a non-steroidal anti-inflammatory drug (NSAID) in a class of medications called analgesics and antipyretics. Paracetamol Tablets are used to relieve mild to moderate pain from headaches, muscle aches, menstrual periods, colds and sore throats, toothaches, backaches, and reactions to vaccinations, and to reduce fever. Paracetamol may also be used to relieve the pain of osteoarthritis. It relieves pain in mild arthritis but has no effect on the underlying inflammation and swelling of the joint. Looking for Pain Killers ?